Four exceptional alumnae volunteers were presented with the Sed Ministrare Volunteer Award at the Wellesley College Alumnae Association’s 92nd annual Alumnae Leadership Council on Saturday, October 17. This annual award, which was established in 2014, honors and celebrates outstanding volunteer service to Wellesley College. "This award provides a wonderful opportunity to highlight the tremendously creative and energetic efforts of our alumnae volunteers and the impact those efforts have on their classes, clubs, shared interest groups, or the College," said Georgia Murphy Johnson '75, Wellesley College Alumnae Association president. 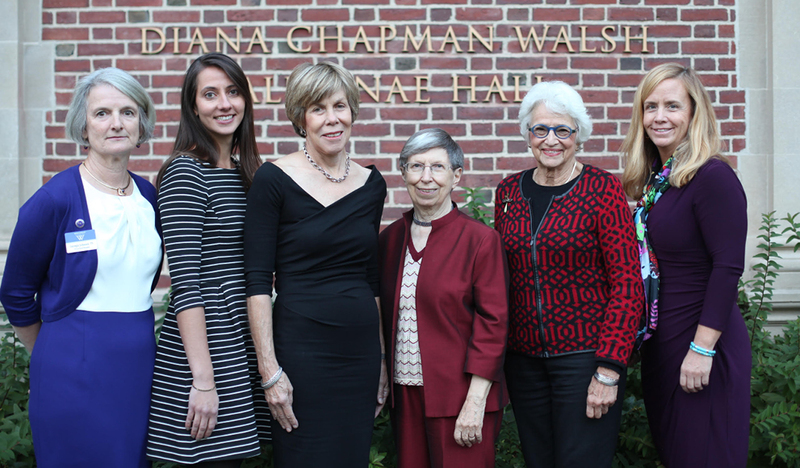 The 2015 recipients are Jane Kentnor Dean '56, Bridget O'Connor Garsh '04, Charlotte "Chari" LaRue Isaacs '68, and Elizabeth "Betty" Barr Wang '54. As a student, Jane Kentnor Dean '56 was involved with almost all of her class events and not much has changed—in the years since her graduation, Dean has held almost every class officer position and has chaired several class committees, including her 50th Class Reunion in 2006. According to the Alumnae Association, Dean’s ongoing leadership and dedication are responsible for "the exceptional connections and spirit her class has sustained over the last 60 years." Dean has also played an important role in the Connecticut area, serving in many capacities for the Fairfield Villages Wellesley Club. Bridget O'Connor Garsh '04 has been called a pillar of strength for the Wellesley College Alumnae of Boston Club (WCAB). As vice president of programming, Garsh brought energy and enthusiasm to long-standing club events, initiated new programs designed to appeal to a diverse range of alumnae, and reinvigorated participation in local events. Garsh now serves as president of WCAB. Under her leadership, the club has expanded volunteer committees. Garsh has personally encouraged participation and programming through decade representatives and shared interest group liaisons, and connections between senior students and local alumnae. Chari LaRue Isaacs '68 is a great example of how a single volunteer’s vision and leadership can energize an organization—and even transform it. An active member of the Sarasota Wellesley Club, Isaacs has introduced new ideas and challenged the members to "think outside the box." Through her leadership, the club has become involved in projects that reflect the College's dedication to service, including organizing the Ivy League College Fair and the Sarasota Mothers and Infants Program of First Step, which connects alumnae and enables them to make a difference in young women's lives. Betty Barr Wang '54 began her service to the College early with a very impactful act: encouraging her cousin, Nannerl Overholser Keohane '61, to attend Wellesley. Keohane later became Wellesley’s eleventh president and served for 12 years. For over 60 years, Wang has continued to serve the College. She co-founded the Shanghai Wellesley Club and has served as club secretary, event planner, and facilitator, admissions representative, and as a class officer. Through her leadership and efforts, the Shanghai Wellesley Club has grown to over 50 members. Learn more about the Sed Ministrare Volunteer Award, including selection criteria and how to nominate an alumna, by visiting the Wellesley College Alumnae Association website.